Wait. Is that a fried chicken taco served on a waffle instead of a standard tortilla? Yes. Yes, that’s exactly what’s on the menu at Cluck Clucks Chicken and Waffle joint. 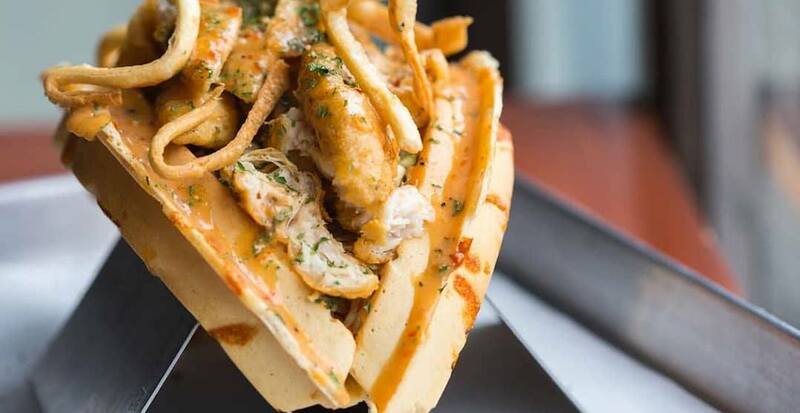 That’s boneless chicken breast topped with shredded lettuce that’s seasoned with zesty ginger, fresh lime and diced onion, drizzled with Cluck sauce and topped with crisp tortilla strips, all piled into a folded jalapeno and cheddar waffle. And you can tuck into it at both the Queen West and The Esplanade locations. If you’re looking for something a little more portable than a taco — though that is hard to come by — the Queen West location also has fried chicken in a waffle cone. This is ideal food for when you’re on-the-go. Or, it’s a perfect appetizer to enjoy before you dive into one of these wicked tacos. This is an elevated way to celebrate Taco Tuesday.